NORTHUMBRIA ANTHOLOGY 20 CD BOXSET Brian Ferry, Alex Glasgow, Tim Healy, Brian Johnson, Jimmy Nail, Alan Price, Dave Stewart, Sting, Kevin Whately. Presented by Charlie Hardwick and Eric Robson. Take the top Tyneside songs and the cream of North East talent, put them together in a variety of regional locations and then link the unforgettable performances with background to the songs and songwriters plus spectacular aerial footage. 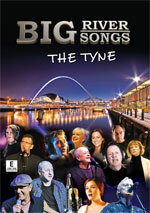 Big River Big Songs is the ultimate DVD collection of Tyneside singers, songs and songwriters. Featuring Sting, Jimmy Nail, Mark Knopfler, Joe McElderry, Jill Halfpenny, Lindisfarne, Tim Healy, Alun Armstrong, Kevin Whately, Brian Johnson, Billy Mitchell, Denise Welch, Angie Lonsdale, Chelsea Halfpenny and many more. 'Up in the North East we're very proud of our musical heritage so I'm absolutely sure that this will be a DVD you'll play again and again.' Kevin Whately. 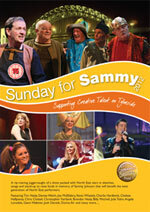 75% of the profits from this DVD will be donated to the following Not for Profit company and Charities: the Northumbria Anthology, the Sunday for Sammy, the Bobby Robson Foundation and the Rainforest Foundation. Perhaps this tremendous DVD should be re-titled 'Big Hearts, Big Soul' such is the impact it's had on me! It goes without saying that Geordie-land has spawned some of this country's best musicians and actors and (as if you needed any) here is proof that artists the calibre of Kevin Whately, Tim Healy, Jimmy Nail, Lindisfarne, Billy Mitchell, Sting and Mark Knopfler are as welcoming as a freshly pulled pint of 'Newky' Brown. Produced with consummate skill by Lindisfarne's Ray Laidlaw and with commentary jointly provided by Emmerdale's Charlie Hardwick and Eric Robson they segue between the stunning visual landscapes of the Northumberland region with musical and thespian contributions (apart from those already credited) from Alun Armstrong and a particularly nice rendition of 'Still I Love Him' performed by current Emmerdale favourite Chelsea Halfpenny. For any Newcastle football supporters there's a roaring version of 'Blaydon Races' courtesy of Whatley, Healy & Nail (worth purchasing the DVD on its own merits) and Sting joined by Nail on a striking duet of 'The Waters Of Tyne'. My one reservation...and it's only a minor one...is that Joe McElderry performs the glorious 'Big River' where personally I think it should have been handed to the more mature Nail or Mitchell to give it the gravitas it really deserves. There's plenty here for the 'folk' music enthusiast and, while you're at it 70% of the profits go towards some very deserving charities. Mawson & Wareham have provided us with some great DVDs in recent years and this one certainly wears its heart on its sleeve. Highly recommended! It seems odd but in the long history of traditional folksongs of the North East, and in particular Newcastle, there is one thing not represented. Acclaimed film-maker Geoff Wonfor says: 'Funnily enough there doesn't seem to have been one song written about the Tyne Bridge.' And he should know. For the past10 years Geoff, along with Ray Laidlaw and the help of knowledgeable researchers like local folk legend Johnny Handle, have gone through the region's music archives and come up empty-handed. Maybe one day someone will meet the challenge, however the oversight does not harm Big River Big Songs – The Tyne as the team behind it have hit pay dirt with the 31 songs they did find. It took some editing down to that figure, such was the wealth of material. 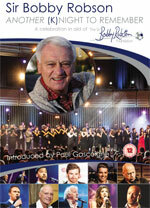 The songs are as much the stars as the stellar line-up of North East names, old and young, who perform them on the DVD. It includes Sting, Mark Knopfler, Brian Johnson, Jimmy Nail, Joe McElderry, Jill Halfpenny, Lindisfarne, Tim Healy, Alun Armstrong, Kevin Whately, Billy Mitchell, Denise Welch, Angie Lonsdale, Chelsea Halfpenny, Sir Thomas Allen and Graeme Danby. 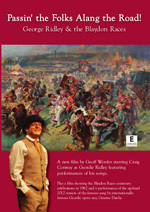 The songs include favourites by George Ridley and the so-called bard of Newcastle, Joe Wilson, in a variety of styles, from traditional to opera, right up to the modern era. Geoff, famous for his work on cult TV show The Tube and the critically acclaimed The Beatles Anthology, says: 'We got a group of mates together. Ray pulled in his friends and I did mine too.' The idea for it came from Brian Mawson, a local music stalwart from the 1960s whose first job was working the door at the old New Orleans Jazz Club on Forth Banks, Newcastle, now home to Sachins Indian restaurant, before going on to manage Windows music shop and launch perhaps the city's first record label, Rubber Records. He now owns and runs Mawson & Wareham (Music) Ltd which is heavily involved with the Northumbria Anthology project, a not-for-profit company supported by a Heritage Lottery grant sourcing music and poems from the region between North Yorkshire and the Scottish borders. He asked Geoff and Ray to put visuals to the whole project which they did through footage provided by the likes of Tyne & Wear Archives & Museums and the Northern Region Film and Television Archive, as well as coming up with new footage of their own and combining the two. Around a year ago they produced a version of the DVD and handed it over to Brian. Ray says: 'He wanted it to be more informative and we went back to the drawing board. We decided to base it on songs involving the River Tyne and writing a background to those songs. We ditched quite a few tunes and found some more.' They then approached Emmerdale actress Charlie Hardwick and veteran North East TV presenter Eric Robson to narrate it. Charlie also performs on two of the songs. Eric, however, does not. 'I was hiding under a blanket when musical talent was handed out,' he laughs.